San Bernardino County (Calif.) Sheriff's Department officials describe the series of events that led up to their armed confrontation with Christopher Dorner. Christopher Dorner, the former LAPD police officer who carried out a vengeful rampage against his fellow ex-cops and others, died of a single, self-inflicted gunshot wound to the head at the end of an intense firefight with police in rural Big Bear, Calif., authorities said Friday. At a late-afternoon news conference, San Bernardino County authorities said that the cause of death was determined by an autopsy conducted Thursday by the county Coroner’s Office. 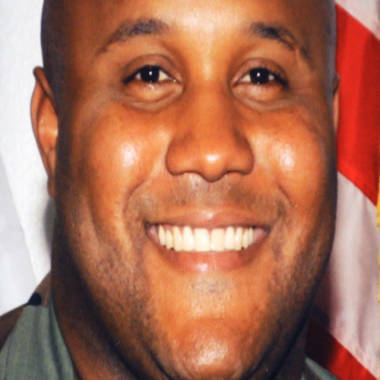 Authorities had been unsure whether Dorner killed himself, had been struck by a deputy's bullet or had died in a fire that engulfed the cabin during the shootout. The coroner's finding still must be finalized. In their most detailed account to date of the final days and hours of the hunt for Dorner, 33, San Bernardino County sheriff’s officials said they tried to force the suspect to surrender before accidentally setting the cabin where he was holed up on fire when they shot a pyrotechnic chemical device inside. Sheriff John McMahon also detailed the extent of the arsenal that Dorner had with him in his final days, which he spent eluding searchers in the mountainous area east of Los Angeles. Among the items recovered from the cabin where Dorner died and other locations and vehicles were numerous assault weapons; semiautomatic handguns; a .308-caliber, bolt-action sniper rifle; high-capacity ammunition magazines; a total of 10 suppressors or silencers; tear gas and smoke canisters; a military-style load-bearing vest; and a military-style Kevlar helmet, he said. The sheriff also confirmed that Dorner spent most of his time on the run hiding in a condominium just steps away from the command center set up to find him. He said deputies had visited the unit, which was locked, on the evening of Feb. 7, but received no answer when they knocked on the door and then moved on. Sheriff’s Capt. Gregg Herbert also elaborated on the tactics used during the confrontation with Dorner at the cabin in the Seven Oaks area, saying that when deputies responded to the scene they noticed tracks in the snow in front of the cabin where Dorner had taken refuge. As Deputy Alex Collins, Detective Jeremiah Mackay and other officers were conversing in the street in an attempt to devise a plan to check on the cabin, Dorner opened fire on them, striking both deputies multiple times, Hebert said. The other deputies returned fire, and dodged an onslaught of bullets to get to the injured officers and drag them out of the line of fire, he said. MacKay died later at an area hospital; Collins remains hospitalized after undergoing multiple surgeries. Dorner died hours later inside the cabin, after he and law enforcement officers exchanged hundreds of rounds. Police had been seeking Dorner since last week, when they say he launched a deadly revenge campaign against the Los Angeles Police Department over his 2009 firing. Before launching his onslaught, he posted a rambling 1,400-word manifesto on Facebook in which he allegedly wrote that killing was “a necessary evil” to avenge his firing and also threatened other law enforcement officers and their families. Before killing the deputy in the San Bernardino mountains, Dorner is suspected of slaying a couple in Irvine and a police officer in Riverside.